Feeling cynical about setting new goals? Have you given up on New Year's Resolutions? Are you inspired to start, but can't seem to finish? 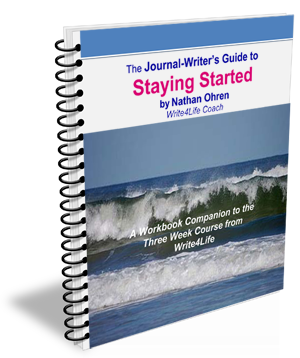 This workbook discloses a unique secret to staying consistent in journaling, or in working steadily on any habit or goal that is important to you. The book includes effective journaling exercises, writing prompts, and activities that will help you get to the heart of what matters for you. Begin creating your own system, one that will keep you supported in furthering your goals, fueling your enthusiasm, and setting milestones and checkpoints -- so you will be aware when you are getting off-track. End each year with a sense of accomplishment. Don't let complacency settle in: take charge of your personal growth and development! This book is included FREE to students of the three-week Getting Started, Staying Started journaling workshop. Click here for more details and to register today!